As its characteristic, the Home was very clean and showed high level of organization as one came in. The reception and the ushering ensured everyone fitted in on arrival and became part of the group. The ceremony was started exactly at 10 am with the raising of the National Flag and the flag of the Home, by children of the Home together with the students of St. Lwanga Naro moru Catholic Academy. The ceremony started with a very good note, everyone present was in the right mood of celebration and as it turned out, it became a beautiful celebration and a worthy Feast for 30 years Jubilee celebrations for the Home. 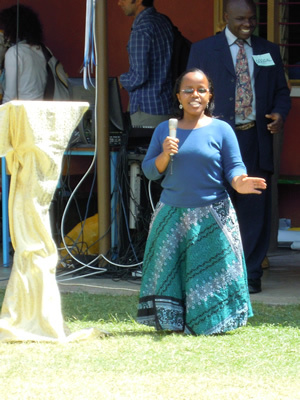 The Home compound was packed to capacity; more seats had to be borrowed from the neighbouring church and schools. The participants were ushered and seat comfortably, and there were peace and order. 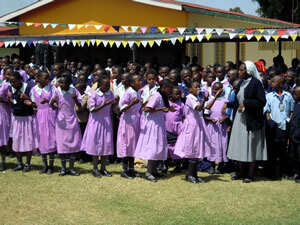 Many children from the neighboring schools came smartly dressed in their uniforms to grace the occasion and to join their disabled colleagues, to celebrate the day with them and entertain them. It turned out to be a very impressive occasion. Main Celebrant was Rev. Fr. Elias Gichuki the Vicar General. Other priests present were Rev. Fr. Philip Kihara, Fr. In charge of Naromoru Irigithathi Parish, Fr. Kabaiku, Fr. In charge of Munyu Parish, fr. 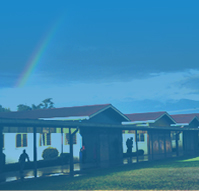 J. Wahome of Natomoru Irigithathi Parish,, Fr. 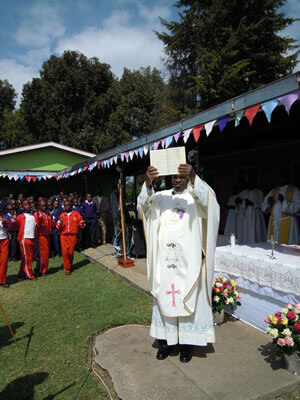 David Mucheke, Naromoru Parish, Fr. Boniface Mwangi, Director Caritas Nyeri, Deacon Lucas, Naromoru parish. Rev Fr. Philip kihara welcomed the Vicar General and the entire congregation to the Celebration of the Holy Mass to thank God for the 30 years the Home has been in existence. 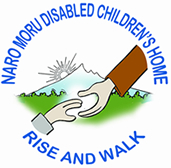 The entrance dance was conducted by the Naromoru Disabled Children’s Home, and was well done and touching. The choir members, in their multicolour traditional costumes lead the celebration of the Mass with beautiful songs. Bible procession was conducted by Shalom School, the offertory dance was conducted by St Lwanga students and Victory school together with the choir. This one was a wonderful experience with parishioners following with their symbolic gifts and offerings. It was a scene to behold. 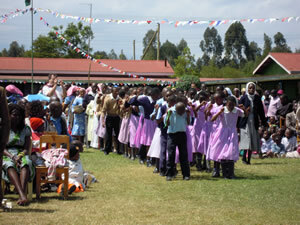 Thanks giving dance was conducted by the youth and the choir. 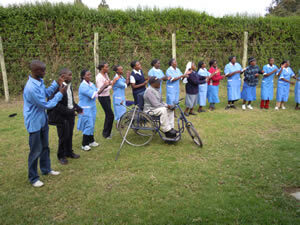 The story of the Home was told through a play by the Disabled Children undergoing treatment in the Home. The play was captivating, relevant and most educative. The children were very well rehearsed and went through this play with a lot of confidence. The clarity of their voices, and the enthusiasm with which child played his part brought the best out of the actors, and the audience moved forward not to miss any part of the play. The strong message in the play concurred with the day sermon: the children born with disability should be brought to Naromoru and be given a second chance. Through the hard work of all persons working in the Home and the operation from Italian Doctors, the children brought to the Home with disabilities are able to “rise and walk” with renewed dignity and strength, to the amazement of those who never believed it would happen, like Red’s mother. Here are some excerpts of the homely of Fr. 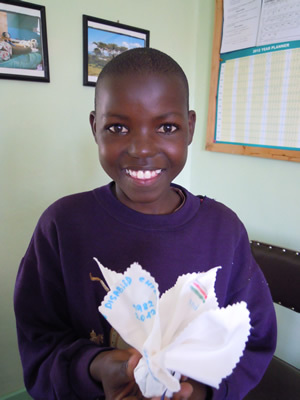 Elias Gichuki , from the speeches given by a patient of the Home, Sr. Silvia, Mr. J.B.Bore, Mrs Deborah Mwarania. Sr. Silvia presented the certificates of merit to members of staff who had served the Home for 10 years and above. The ceremony was concluded with the cutting of the cake and vote of thanks by Sr. Anastasia.